While some car accident injuries are quickly identified after a crash, other serious injuries sometimes take time and expertise to diagnose. Unfortunately, delayed treatment can complicate your personal injury claim against a negligent driver. Learn more about “invisible” injuries and the importance of medical treatment below. You and your doctors might focus on your obvious injuries first, such as broken bones, lacerations, and contusions. While it’s important to stabilize life-threatening injuries, do not assume that you fully understand the extent of your injuries in the days the follow your car accident. These conditions can be disabling, and typically also require significant medical treatment. If you are experiencing any soreness or pain, you should immediately seek medical treatment. There are multiple reasons why promptly reported medical treatment might improve your situation. The earlier you see a doctor, the sooner you will get referrals to surgeons and other medical specialists. While not all injuries can be quickly and easily healed, prompt medical treatment gives you the best possible chance for a full recovery. Many people think that their aches and pains will improve over time — or just don’t like visiting doctors. Unfortunately, however, insurance companies are highly skeptical of late-reported injuries. If you delay medical treatment, there’s a good chance that the insurance company will deny your claim. You are injured in a car accident. At the crash scene, you report a mild headache and some neck pain to the police officers. While you don’t seek immediate medical attention, you go into your doctor’s office two days later, complaining of blurred vision, poor concentration, and an increasing headache. You describe the accident to your doctor, noting that you’ve had a headache and neck pain since the crash.Your doctor prescribes medication and asks you to return in a week. At your follow-up appointment, you report ongoing, severe headache and vision problems. Your doctor orders a CT scan and diagnoses you with an accident-related post-concussive syndrome. After a car crash, you ignore your aching shoulder. While the pain increases over time, you assume that it will go away eventually. As you continue to work and perform your daily activities, your shoulder pain increases. After six months, you mention your shoulder pain at a doctor’s appointment. An MRI shows some damage to your rotator cuff and some arthritic changes. Once your doctor recommends surgery, you mention your car accident for the first time. An insurance adjuster is more likely to approve Example A’s claim because there is consistent evidence linking the accident to the injuries. 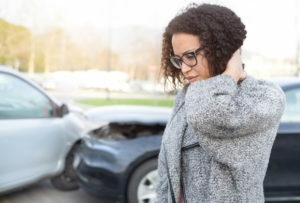 While Example B might have a legitimate car accident injuries claim, the delayed complaints give the for-profit insurance company a reason to dispute it (and cut costs). Follow your doctor’s recommendations (to the best of your abilities). Accurate medical records are an important part of your car accident injuries claim. First, these records help your doctors communicate with each other — helping them tailor your medical treatment to your needs. Second, medical records help your lawyer, the insurance company, and the courts understand your circumstances in addition to the possible causes of your injuries. If you’ve delayed medical treatment, don’t panic. Instead, contact an experienced Orange County personal injury lawyer. Depending on the facts of your claim, a lawyer might be able to strengthen your claim with additional medical evidence as well as expert testimony. However, do not delay. As time passes, it might become increasingly difficult to address the weaknesses in your claim. California law imposes strict filing deadlines in cases involving car accident injuries. Typically, you must file a personal injury lawsuit within two years of the accident. If you file a lawsuit after this deadline (called the “statute of limitations”), the court will automatically dismiss your claim. For this reason, you should never delay medical treatment. If someone’s negligence caused your car accident injuries, contact Russell & Lazarus for a complimentary evaluation. Our team of Orange County personal injury lawyers assists drivers, passengers, pedestrians, and cyclists with their insurance claims. Call us or submit our online contact form today.